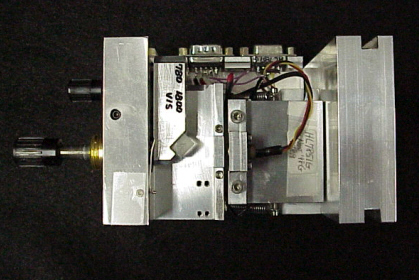 Several designs exist for external cavity tunable diode lasers used in atom trapping experiments. Our aim was to combine the best aspects of previous designs but make improvements that would enable students to align and adjust the lasers more conveniently. Our lasers have been utilized in dual-species MOT experiments involving Rubidium and Cesium. We present construction details for several configurations, and show data evaluating their relative performance. This graph shows the chip modes for a typical Sharp LTO24 780nm laser diode. This spectum was obtained with no external cavity and the laser running at a current just below threshold. 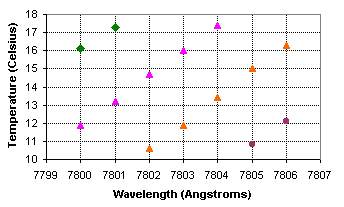 All wavelengths that fit in the chip by an integral number of half-wavelengths gain intensity. The crystal itself emits wavelengths over a large range but only those that fit properly will add constructively after reflection at the crystal's end facets. This data was taken by setting the monochrometer to a specific wavelength and using a thermoelectric cooler to vary the temperature of a laser diode operating just below threshold. The graph shows that LTO24 chipmodes shift by an amount equal to their spacing for each 4-degree change in temperature. 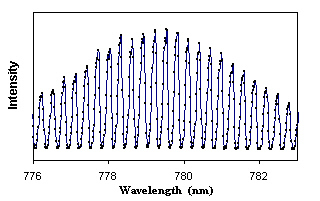 Our external cavities use either a 1200 or 1800 line/mm diffraction grating as one end reflector. Alignment and coarse tuning adjustments of the L-shaped grating arm are made with 80-pitch screws in the grating end plate, and a Thorlabs AE0203D04 piezo-actuator provides fine wavelength tuning. The grating end plate can be detached and replaced without disturbing these adjustments, simplifying alignment of the laser diode with the Thorlabs AC256T-C2 collimator lens. With the external cavity assembled and enclosed, collimation adjustment screws remain accessible through holes in the grating end plate. To obtain an output beam, a 45-degree beamsplitter can be mounted in the cavity, or the grating's zero-order diffracted beam can be used. The first component that we investigated was the beamsplitter. We evaluated Melles Griot models 03BTF013, 03BTF015 and 03BTF017, measuring transmission/reflection ratios for horizontal (p) and vertical (s) polarized 780 nm light. If more power is transmitted, the tuning range of the external cavity laser should be improved because there will be more optical feedback to the laser diode. If more power is reflected, the output beam is stronger but the tuning range is narrower. The next step was to reattach the grating end plate and determine if the beamsplitters would behave as expected once the external cavity was formed. The output power was measured in the two beams that are reflected to the side, referred to as the weak beam and the strong beam. The following graphs show the data for the 015 beamsplitter, and the subsequent table summarizes the results for other beamsplitters.